San Mateo tenants facing eviction are unhappy about the city's laws that allow landlords to evict them without a reason. The frustrations sparked a rally Friday outside an apartment complex, where one family says they are being evicted after complaining about rats, mold and cockroaches inside their unit. "The garbage was not picked up for almost a week," tenant Jamie Delgadillo said. Delgadillo said rats showed up inside his apartment after trash from the entire complex piled up outside. He shared pictures with NBC Bay Area that show mold growing on the bathroom walls. Now he said his children suffer from asthma and flea bites. Delgadillo said he has complained several times to his landlord, Heritage Realty. Now, after the complaints he has received a 60-day eviction notice. On Friday, a small crowd rallied and prayed on Delgadillo's behalf. 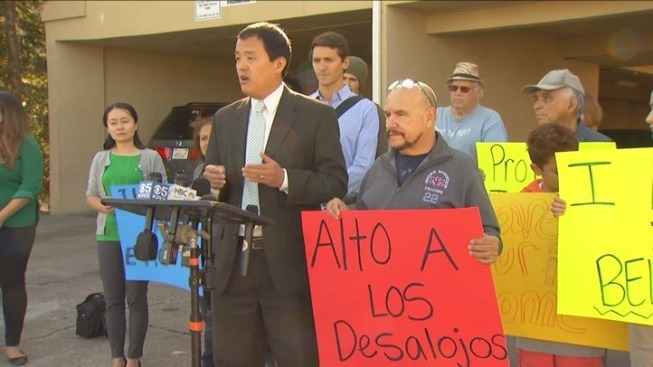 "Ask these landlords and landlords throughout San Mateo to search into their souls and have a heart," San Mateo Deputy Mayor David Lim said. If passed, an initiative on the November ballot in San Mateo would give tenants like Delgadillo more protection. "It would require, if landlords are going to evict tenants that they have a good reason," said Daniel Saver with Community Legal Services. Currently, it is legal for landlords to evict tenants for no reason. Attempts to reach out to Heritage Realty for comment were not returned.